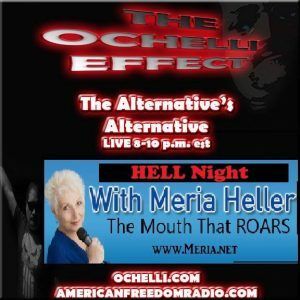 9/18/16 Meria was interviewed on Chuck Ochelli’s show on the 14th. 4 Responses to "Meria on the Ochelli Effect 9/14/16"
I know a lot of the answers to this and why its happening. Dont Knock Adam and Eve Meria hehe i was there, it was an anunnaki failed experiment. the real reason to be in a Relationship other then Love is to create something together and i am not talking about kids hehe. 911 hmmm as long as people think in human terms they will never understand it. It was a sacrifice and the opening of a dimentional gate. ( satanistic black magic ) to further an agenda to change this reality. All of the actors involved are either posessed or mind controlled. While all the humans argue among themselves about who did what and what laws where broken, the veil was pulled over everyone energetically so that the real goals are never understood. Their goal is to destroy Prime Creators Program and to do that they attack all aspects of Love and Heart . Earth = Heart if you move the H. This is The Living Library ( its real purpose ) is for creation. It is a tottal inversion of reality in order to take control of this planet and the 13 Library network in the universe for their own use. There is another reason behind all that but only i can understand that one that i know of so far. don’t doubt it. Good take. just discussed and explained the Annunaki to a friend yesterday!